We took the Titleist AVX to the course and had golfers try it, giving each two sleeves so they could put it in play for several rounds. They were a mixture of handicaps, female and male, ranging from single digits to low 20s. All were first asked if they had ever tried “soft-feel” golf balls and if they liked them and then, assuming they liked the AVX, if they would be averse to its $48 per dozen price. 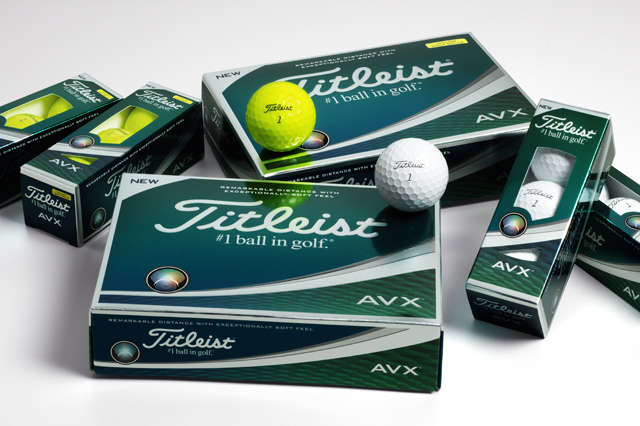 The AVX is the first premium category ball from Titleist since the Pro V1x in 2003 and is meant to compliment it and the Pro V1 not pirate sales from the two flagship models. Next the AVX has a lower compression core to help achieve a softer feel contrasting with the Pro V1 and the firmer Pro V1x. The mantle has lots of flex contributing to both ball speed for distance and to control spin making it the lowest spinning of the three. The cover is a new as well, a proprietary thermoset cast urethane elastomer of something called GRN42 formulation. Put altogether the AVX with approximately an 80 compression goes slightly farther with both the driver and irons so even though its trajectory is lower club for club you are often will be hitting a 9-iron where before it might have been an 8-iron or even a seven. Thus, the descent angle is steep enough to mitigate the lower spin of the AVX versus the Pro V1 which has a compression of approximately 90 and certainly the Pro V1x at around 100 compression. There were a few negatives. One 15-handicap male did not see any more distance and another, who plays Bridgestone, saying the AVX was a good ball but he was probably not going to change though he didn’t state a reason. Overall and from my experience testing and playing soft-feel golf balls since they first came on the market the Titlesit AVX is a strong choice for those wanting a lower trajectory, lower spinning ball that still has a soft feel. Priced the same as the Pro V1 and Pro V1x at $48 per dozen and for those who prefer it, the cover chemistry allows Titleist to make a yellow version.